The temperature was edging below zero when the first drug dealer approached. “You want something?” he asked, peering at us from under the hood of his jacket. We said no and he wandered away, casting us a suspicious glance over his shoulder. Soon, half a dozen men were eyeing us. “What you doing here?” shouted a man with a Jamaican accent. To be fair, we were on their turf. If you’re waiting around the Sir George Étienne Cartier monument at nine o’clock on a cold October night, you probably aren’t there to enjoy the view of Mount Royal. We could hardly pass judgement, since we were waiting for our friend Boris to meet us for an illicit activity of our own: a campfire in the middle of the city. The steep, densely-forested east slope of Mount Royal is a peculiar place. There’s a spot about halfway up that is so well sheltered by rocks and trees that patches of winter snow can last until June. Walk into the woods from Park Avenue and it never takes long to feel as though you’ve somehow been transplanted to somewhere in the Laurentians. The illusion is even more pronounced at night, when raccoons rustle in the bushes and rock outcroppings appear unexpectedly in the dark. Of course, the city never disappears completely — the faint rumble of traffic, the wail of an ambulance. The sky is so bright you don’t even need a flashlight to see your way through the woods. That’s exactly what makes a nighttime trip up the mountain so exhilarating, because you’ve managed to escape the city without actually leaving it. And really, what else are you going to do in the woods at night? It’s only natural to make a fire. When Boris finally arrived, we said goodbye to the dealers and made our way into the forest, armed with various essentials: flashlights, beer, marshmellows, mulled wine. Boris knew a perfect spot for a fire, a small clearing on the edge of a short cliff. I’m still not sure how we found our way there — the part of your brain that identifies two-for-one pizza places and dépanneurs as navigational landmarks can apparently do the same for trees and rocks — but it didn’t take us long to arrive. I made quick work of unpacking the beer while others scavenged for firewood. Campfires have a primeval appeal. They speak to the part of our soul that still inhabits the caves of Lascaux. But they aren’t traditionally associated with the city, except maybe for the garbage can fires that homeless people in the movies use to keep themselves warm. But why not? Some people in Toronto asked themselves this question, decided there was no good answer, and held public campfires in Dufferin Grove Park, an unprepossessing patch of greenery in the city’s west end. A few hours after we got our Mount Royal fire going, we heard some noise in the bushes. At first, we thought it might be raccoons — they had paid us a visit earlier. But the rustling grew louder. We saw a flashlight. Police? What would happen if we were caught? Then a man emerged from the darkness. He looked thirty, maybe thirty-five. A bit scruffy. “Can I have some hot dogs?” he asked. We invited him to sit down. He told us his name was Michel; he had been living on the mountain for the past six months. “The city is just crazy, you know? On the mountain you can do what you want,” he said, munching on a sausage. It seemed an odd statement to make when you’re sitting ten minutes away from the 80 bus. He told us about a cave-like shelter where he slept when it rained. 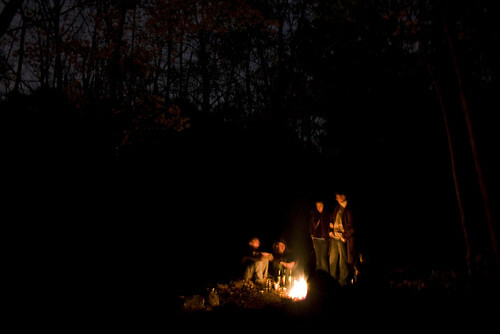 I took part in another Mount Royal campfire when I returned to Montreal last summer. I tried to replicate the experience here in Hong Kong, too, after I discovered a secluded barbecue site near the World War II ruins of the Pinewood Battery, a fifteen minute walk from the highrises of the Mid-Levels. It went well, but didn’t afford quite as many opportunities for chance encounters as Mount Royal. A couple with flashlights strapped to their heads walked by at one point, but for the most part, we were accompanied only by whatever war-weary ghosts live inside the old battery. 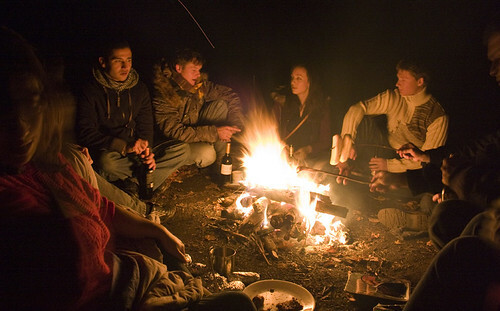 Still, the important things were the same: a circle of warm bodies around a hot fire, the crackle of dry wood, a trance-like moment spent watching the last embers disintegrate into dust. And a short walk out from the woods, blinking into the city lights. This entry was written by Christopher DeWolf , posted on Wednesday February 15 2012at 10:02 am , filed under Asia Pacific, Canada, Environment, Public Space, Society and Culture and tagged Bonfire, Hong Kong, Montreal, Mount Royal, Parks . Bookmark the permalink . Post a comment below or leave a trackback: Trackback URL. Were there any monkeys in the forest trying to attack you?